A couple of weeks ago I got an email from Amara’s Mommy with a recipe link for Cream Cheese Monkey Bread. The email simply said, “You make this for me.” While Jenna’s request was motivated by her love of cream cheese, she also knows that I am always looking for recipes that Amara and I can make together. And if we happen to make these creations just before she and Justin come to pick Amara up on Sunday mornings and they are forced to eat them, well all the better! It had only been a few weeks since Amara and I last made our Original Monkey Bread for them. That stuff really is addictive! Amara and I had a wonderful time putting it together. This recipe doesn’t require all of the rising time so we were able to wait until just before Mommy and Daddy were coming to start it. She had fun patting out the little biscuits. I was responsible for cutting the cream cheese into 20 pieces. The one thing I would do next time is maybe pop that cream cheese in the freezer for a few before cutting it but I had fun licking my fingers afterwards! Amara wrapped those pieces of cream cheese in the biscuits and topped each layer with the brown sugar mixture. 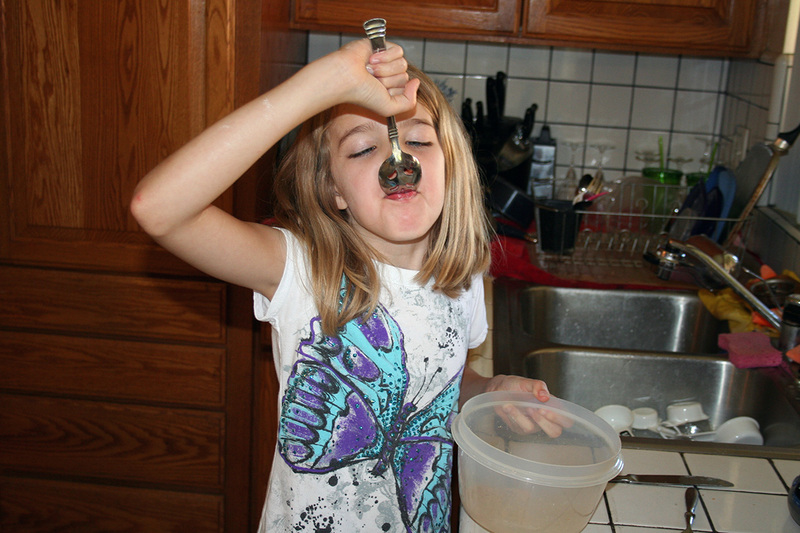 As she was almost finished sprinkling it on she looked down into the bowl that had about a tablespoon of sugar/cinnamon mixture in it and she says, “I think it has enough on it don’t you Grandma?” “Sure, looks good to me.” “Can I eat the rest Grandma?” Didn’t see that one coming or anything! 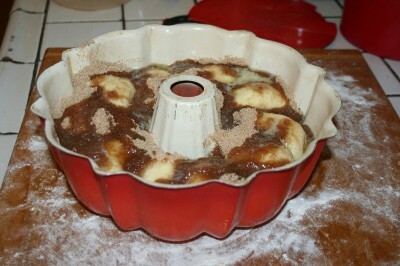 This is the monkey bread before it went in the oven. This is the monkey bread after it came out. Finally, turned on to the plate and oozing with goodness! We timed it perfectly. They arrived about 5 minutes after it came out of the oven. Let me just tell you it really did taste as good as it looks. I should warn you that if you click the photos to see them larger you may drool into your keyboard! We discussed at length our opinions of this yummy creation and whether we liked it better than our Original Monkey Bread. Amara really like the original better because she wasn’t crazy about the cream cheese center. Her Daddy just scooped it out for her and she liked the bread part! The rest of us agreed that it is just different but equally as good! This one is much quicker to make. The bread is a different texture as it is a biscuit as opposed to bread dough and the brown sugar gives it a different flavor, too. It will just melt in your mouth with its goodness. It does have 8 ounces of cream cheese and 6 ounces of butter after all! Verdict is we love them both. 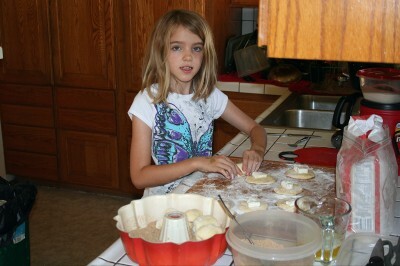 This memory was posted in Indoor Fun and tagged Amara, baking, monkey bread on August 31, 2012 by Grandma Kc. Yeah – with the cream cheese – hands down. I pity the fool who thinks it’s better without cream cheese. 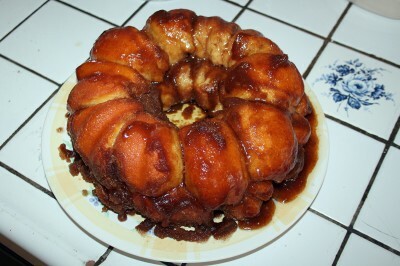 I loooove Monkey Bread and I think I may be in agreement with Graampy if I were to try this one. Just may need to head to the store today for some biscuits. Yum! Great idea for cooking with kids. I hope you and yours have a grand holiday weekend! With or without, it all looks good to me these days! Again, what a wonderful family time together! Well, I love cream cheese so I’d bet I’d love it. It looks delicious, and I can almost smell it through the computer. Plus, you have a beautiful helper which makes it all the better. I made a similar recipe with cream cheese for my card playing group, and they loved it! For my grands, though, I am planning to make the basic monkey bread: no nuts, no cream cheese, no bells and whistles. They love cinnamon toast, so they should love it! As we all know, everything is better with butter… Gotta try this one. You know you HAVE to make this for your sister when you come to visit !!!!! I would GLADLY make this for my sister when I come visit – in 25 days! You get the stuff and we will make it together! Yes I AM drooling ….but I am not turning on my oven today, that’s for sure. UGH it’s hot and muggy again here. HOWEVER hopefully next weekend might be nicer and this will be something to try….I wonder if one of those flavored cream cheeses would be good in it ? I never thought of using flavored cream cheese! I don’t think they have it in bricks but you could get the tubs and use a baby ice cream scoop like you would use for cookie dough. I think they even have a cinnamon cream cheese – that would be so good! If you try it you have to let us know how it turns out and pictures, please! Wow! Sounds delicious and not only that, but I have the “perfect storm” over here to make it! Didn’t really know whay I picked up 2 cans of bisquits last week…they were on sale and I had a coupon! And I have every single other thing in the recipe on hand AND the 3 kiddoes – who love to cook! – will be here all day tomorrow. THANK YOU! I see a wonderful post in your future! I sure hope you get to make this with them, all of you will have so much fun. If you don’t “blog about it” I at least want to see pictures! I always make monkey bread with biscuits, but have never used cream cheese. I’m not sure that I would like it as much. Guess I won’t know if I don’t try huh? Thank you for sharing this again. Amara *always* makes me smile. 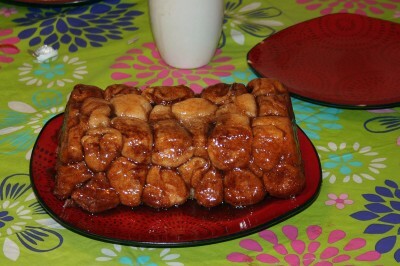 Darn… wish I had remembered Monkey Bread while visiting the grandsons. But I can just hear Bubby saying, “Why do they call it Monkey Bread, Gramma?” Guess I better figure out the answer before sharing the yummy stuff with him. Thanks Lisa! She always makes me smile and cooking with her just becomes more and more fun! OK, here is the answer to Bubby’s question – at least according to Wiki! 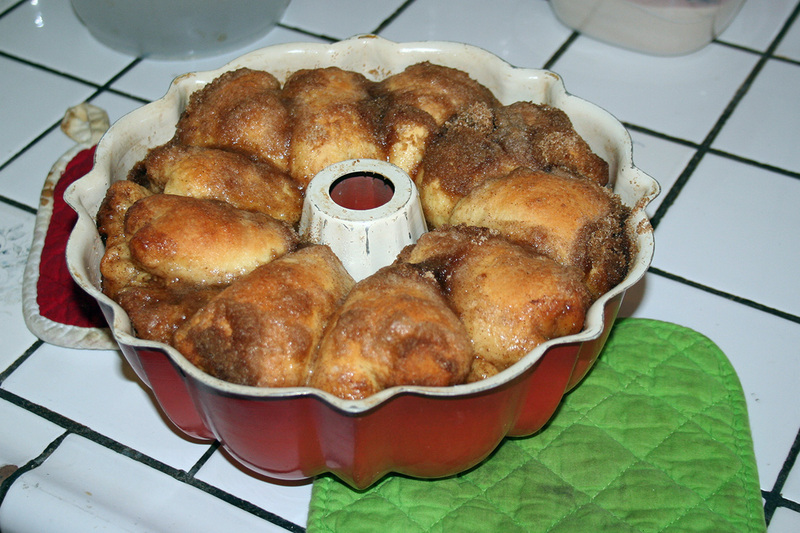 The origin of the term “monkey bread” is uncertain. Possible etymologies include that the bread resembles the monkey puzzle tree. I looked at images of Monkey Puzzle Trees and maybe? Cooking with her just gets more fun and I love that it is one of our things! The best part is all of the conversations we have while we cook/bake. Riding bikes together is fun but you can’t have very many conversations while you do it! I’m a lucky Grandma! This looks so good, and it will be fun to make with my grandkids. Thanks for the good idea!